The most often asked question is "How do I post pics on here?" Luckily it's a simple process and once you've done it a couple times it will be a snap. One thing to understand for beginners is that your photo must first be uploaded to the internet. This article assumes that you already have your photos on your computer. There are far too many makes and models of cameras and memory cards to go into detail on every type, check your cameras manual for details on how to transfer your photos to your computer. The next step is to upload the photos to your new photobucket account. When you see a photo on a forum it is most likely just a link code which "links" to the actual photo being stored on the photobucket servers. After you click "Select photos and videos" you will see a pop-up box that directs you to folders on your computer. It's a good idea to create a desktop folder so you can easily access your photos. Add sub-folders for different outings, seasons, etc. 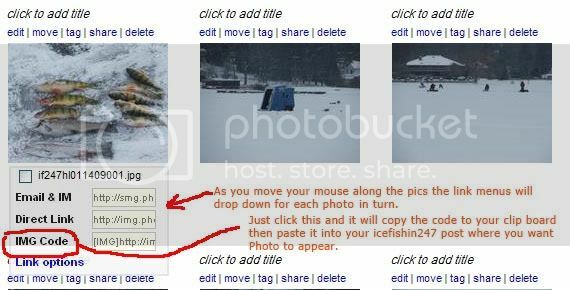 Then simply choose the photos you wish to upload by either double clicking on a single photo, or single clicking on a photo then hold down "ctrl" from your keyboard and continue to select multiple photos. When you have selected all your photos double click and it will begin the transfer. Bear in mind that photobucket does limit storage so it will be wise to upload images that are not super large. A good starting point is 200kb which is more than enough for good web resolution and will get your point across. Using a standard setting on your camera will most likely provide an adequate image. There are tons of free photo editing software which you can download that will allow you to resize and edit your photos. I can recommend XnView and Paint.net which are 2 very good ones and free. You can use google to find the appropriate download sites. I highly recommend you DO NOT use photobucket for uploading any videos. Youtube is another free hosting site, this one for videos, and they do not limit your storage capacity. Adding videos to your photobucket account will quickly eat up your allowed storage space. However, if you do use all your photobucket storage space you can always sign up again with a different username and email. 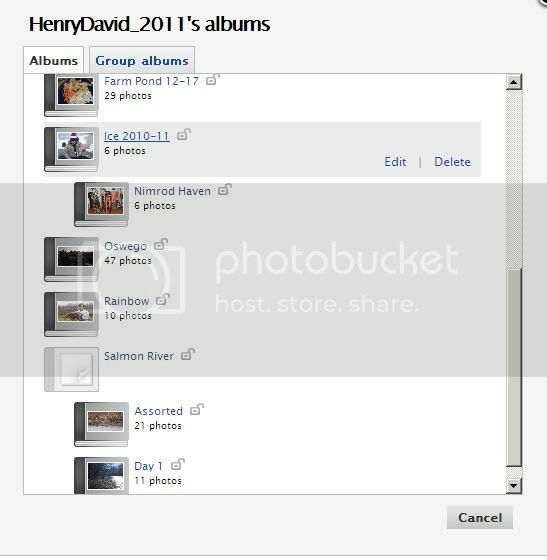 It is a good idea to sort your photos into albums on photobucket. This keeps them neat and in order so when you go back to look for a photo you won't be searching through hundreds of pics in one super large album. It can also help you keep track of your outings if you list dates and locations in your album titles. Your album list appears as an in-screen pop up, from here you can choose an album to upload photos to, or create a new album or sub-album. 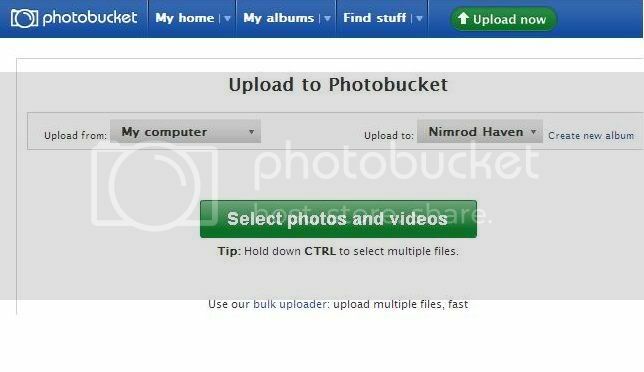 Once the photos are uploaded photobucket will automatically ask you if you wish to add tags (names or descriptions) to your photos, or can simply choose to "Save and continue to my album". At this point you are ready to copy and paste the code. You will want to have two broswer windows open so you can write your post and access the photos you want to insert into the post at the same time. Photobucket changes their layout frequently but the concept remains the same. The graphic below is from the current photobucket layout, Dec. 2010. You simply hover your cursor (mouse) over the photo and the link menu will drop down for each photo. 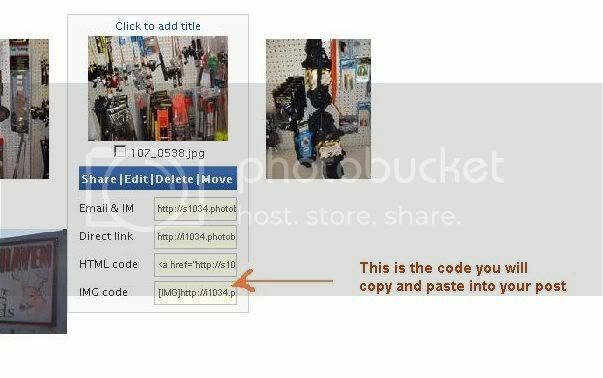 click on the "IMG code" and it will automatically copy the code, then you simply insert it into your new post by right clicking and choosing "paste". One other note, there are several other reliable and free photo hosting web sites out there. You can find several through google. The same with videos. Bump! Read the above if you need to learn how to post photos. Page created in 0.25 seconds with 29 queries.